We know all too well how difficult it can be to control breakouts. For every blemish that disappears, two more seem to pop up out of nowhere. What’s worse, they leave behind redness that creates damaged-looking skin. It’s time to banish breakouts and regain your confidence! 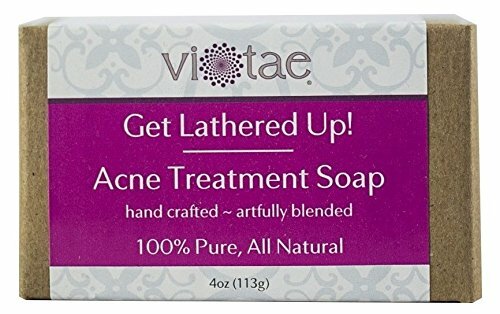 Vi-Tae’s Acne Treatment Soap utilizes powerhouse ingredients like Tea Tree Oil and Lavender to clear up even the most stubborn of blemishes. Their soothing, antibacterial properties help naturally calm your skin and quickly reduce acne, whiteheads, and pimples. Worried about future breakouts? We’ve got you covered! Safflower Oil cleanses pores and removes the excess dirt and toxins that can cause acne, while Palm Oil offers a nourishing line of defense. And to help you achieve a truly radiant complexion, Rosemary, Coconut and Sunflower Oil fight free radicals, protect against sun damage, and provide unmatched hydration! There are plenty of acne treatments available, but most rely on chemical additives that can damage skin in the long run. The Vi-Tae team focuses on natural, organic ingredients to provide you with incredible results without the side effects! Why Choose Our Acne Treatment Soap? Certified organic ingredients Each Purchase is Backed with a 1-Year Guarantee – Satisfaction or Your Money Back! Stock is limited. Order today to ensure availability. Order Your Acne Treatment Soap Now and Save Your Skin! Soothe Acne: With our Acne Treatment Soap, banishing breakouts is as easy as washing your face! Loaded with antibacterial properties, the Tea Tree Oil in our blend helps clear up your complexion while nourishing Lavender Oil reduces soreness and calms skin. Fight Future Breakouts: Ready to conquer acne? Our creamy soap features Safflower Oil to remove excess dirt and toxins from your pores, keeping potential breakouts at bay! We also added Vitamin E-rich Palm Oil, which penetrates deep to offer natural protection. Certified Organic – Made in the USA with lots of LOVE: Our soap is handmade and contains Organic plant-based ingredients. It’s 100% pure, vegan, and safe for all skin types. It contains no parabens, alcohol, petroleum, dyes, fragrances, animal fat, preservatives, or GMOs. Rejuvenate Your Complexion: Rosemary, Coconut, and Sunflower Oil are ready to fight free radicals, defend against sun damage, and repair your skin! They lock in moisture for a soft-to-the-touch texture and even work to fight wrinkles and delay the aging process. Try Risk Free From A Trusted Brand: If you don’t experience less acne and smoother skin in 60 days, you’ll receive a 100% FULL MONEY-BACK GUARANTEE!! !